As far as chocolate goes…what is better than chocolate cake? Hmm…whoa! quick answer here! “Chocoholic” Hot Fudge Oreo Chocolate Poke Cake is real! It’s criminal…I won’t turn you in. I’d have to turn myself in. I can’t quit chocolate. I give you fair warning, it’s addicting. (and that’s different from?…yes, I know! Are you a chocoholic too? Because, I think I have your number! Now get out that 13×9 pan and let’s get our chocolate on! 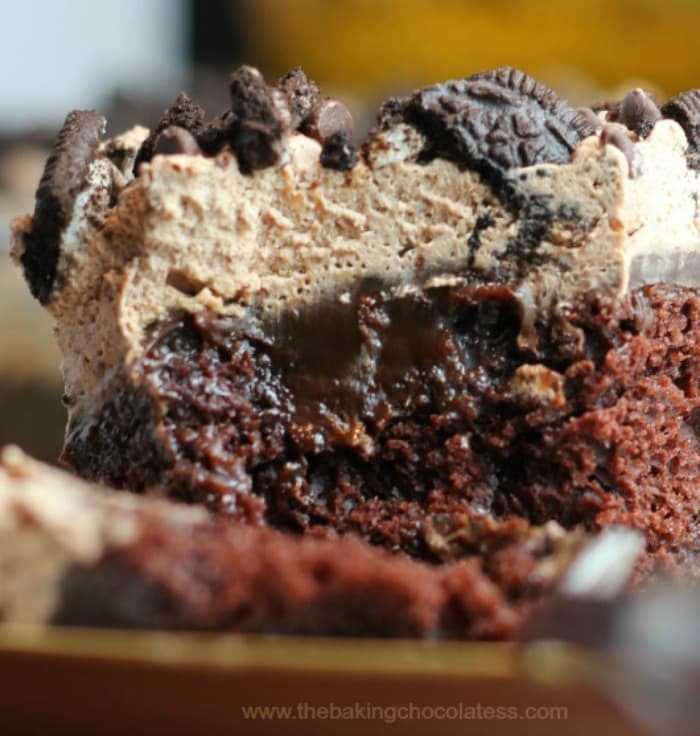 Here’s the recipe for this decadent “Chocoholic” Hot Fudge Oreo Chocolate Poke Cake! As far as chocolate goes...what is better than chocolate cake? Hmm...whoa! quick answer here! Pockets of Hot Fudge inside Chocolate Cake drenched with Chocolate Sweetened Condensed Milk? 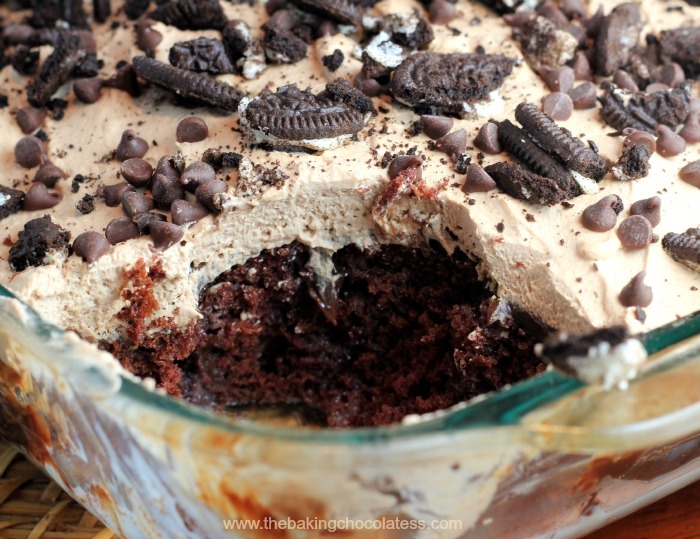 Fluffy Whipped Chocolate Cream Frosting? Yummy Oreo Cookies on top? Some random mini Chocolate Chips? I ask you, "Is this not a 'chocolaholics' dream?" 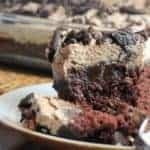 "Chocoholic" Hot Fudge Oreo Chocolate Poke Cake is real! 1 Chocolate Fudge Cake baked in a 13x9 pan. While still warm, poke holes randomly over the top about an inch a part and pour the sweetened condensed milk into the holes. Warm the chocolate fudge topping up in the microwave according to instructions on bottle and pour on top of the holes again and let sit out so the flavors soak in, until cooled about 20-30 minutes is good. Using mixer, whip the whipping cream, cocoa powder and powdered sugar until medium to stiff peaks. Pipe or spread whipped topping on top of cake. Scatter Oreo cookie crumbles and mini chocolate chips on top. Refrigerate sealed and serve right from the pan when ready. You can use regular sweetened condensed milk instead of the chocolate if you wish. You can double up on the hot fudge and/or condensed milk for even more gooey-iness. Definitely acceptable! Thanks Teresa! That hot fudge gets me! 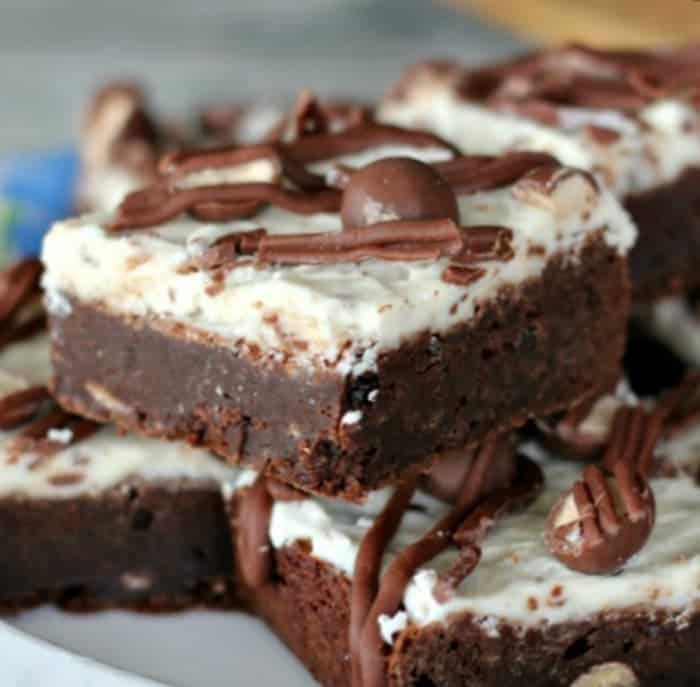 Just made a fudge brownie Bundy today, the chocoholic husband thinks he lost his muffintop (he didn’t, drinks hot lemon water every a.m.),So, anyway, saw the cake and called IT a muffintop feeder. Now THIS!! OH BOY! He loves the original bts cake have been making for years. This poker will blow him away. Best save some money up for new pants for the man!! LOL Teri! That made me laugh. It’s definitely a get your fat pants on cake! Maybe I need to come up with a skinny version? Hope you all have a wonderful Thanksgiving!